It is always a good idea, in my mind, to have a few go-to muffin recipes on hand. 1. For the Muffins: Preheat oven to 375ºF. Butter a 12 c. non-stick muffin tin or place a muffin liner in each cup. With a mixer on low speed cream together the butter and sugar until light and fluffy. Add one egg at a time and mix until just combined. Then, pour in the milk and the dry ingredients and mix until just combined. 2. In a small bowl mash ½ c. of the cranberries until pulpy and juicy. Stir these into the batter. Then, stir in the remaining whole cranberries until just incorporated. Fill each muffin cup ¾ full. 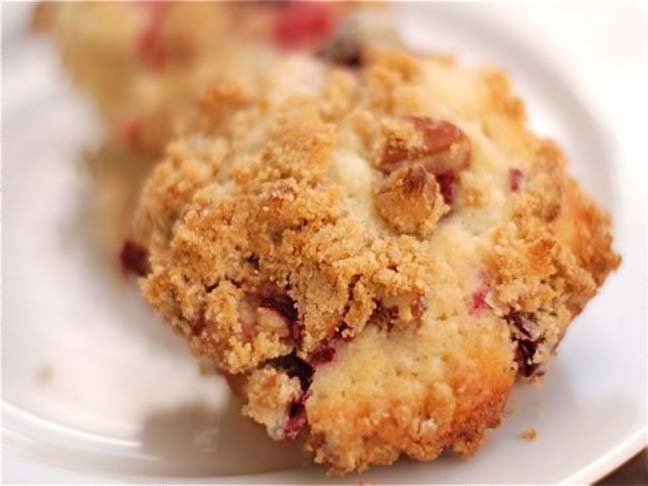 Top each muffin with streusel filling (see below) and baked for 25-30 minutes. 3. For the Streusel: In a small bowl combine the flour, butter and sugar. Work it with your hands until everything is easily mix and large crumbs form. Stir in the pecans and set side.